The National Health Service (NHS) was founded in 1948 and has grown into the world’s largest publicly funded health service. The NHS is the name given to the public health service, which is devolved in England, Scotland, Wales and Northern Ireland. The main principle of the NHS is that healthcare should be available to all who require it. In the United Kingdom, expenditure on the NHS accounts for 7.4 percent of the GDP. Expenditure on healthcare in the UK has generally been on the increase, with more financial spending on public healthcare than on private healthcare. 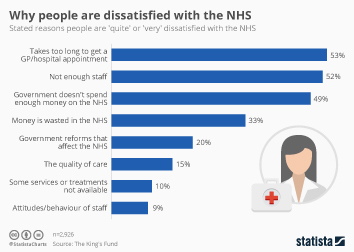 In light of this, the NHS is the largest public employer in the United Kingdom, with an estimated 1.3 million staff comprising of over 110 thousand doctors, over 317.7 thousand nursing staff and around 351 thousand support staff to clinical staff. As the leading provider of healthcare in the United Kingdom, the NHS provides a range of healthcare services for citizens who are ordinarily resident in the UK. Individuals are able to use the NHS public health services for free health check ups and consultations with medical staff. The NHS also provides dental services, with costs varying between the different countries of the UK. Eye examinations are also available through the NHS. In recent years, the National Health Service has received criticism with respect to the number of healthcare professionals moving abroad, the long working hours and the recent junior doctor strikes in England. The influence of 'Brexit' on the NHS is yet to be seen, with many people wondering if the NHS will receive a higher or reduced level of funding.